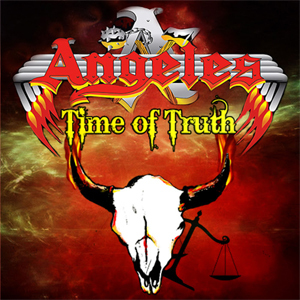 Legendary LA Rock Band ANGELES is back with a new album Time of Truth, released October 16th, via Bongo Boy Records. The album is featured by the band's new lead singer Daniel Ferreira. Get Time of Truth Physical CD's @www.angelesband.com, available on all digital downloads. "Are You Ready For Your Sins"
Special Guest on Bass Guitar - Matt Thorne - "Lonely Road"
John Merritt - Drums - "Goodbye", "God Country and King", "Band Plays On", "Pain"
"Special thanks to Bongo Boy Records, Bongo Boy Music Group, Emidio Vaz - Emidio's Rock Den, Steve Torres - HMG Radio Show, Scott Ellison, Lee Ellison, Rock Star dog Kookie Lytle who has never missed a tour, show or rehearsal. Connie Lytle our driving force and backbone of this band and endless hours of dedication, and all our fans for your support thank you all."